Toucans are birds which are usually black and yellow or black and white with very large beaks that are brightly colored. This bird looks like a hornbill, but from different family. Toucan Birds are nesting in hollow tree trunks and stumps. Sometimes this birds live in the hole of a woodpecker. When sleeping, the birds put its beak on its back and closed its tail with its tail. Where Are Toucans Bird Found? 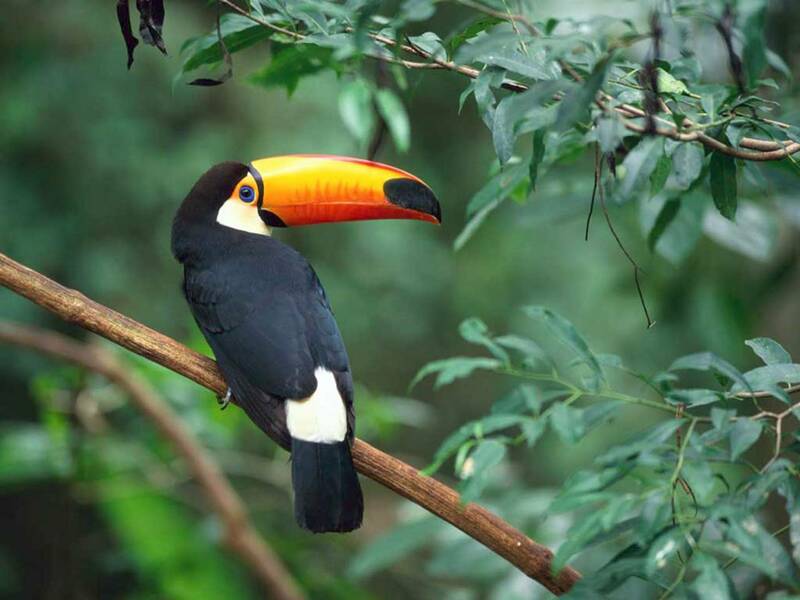 Toucans are found in Central and South America. What Do Toucans Bird Eat? Toucans eat fruits, nuts and berries. Where Do Toucans Bird Live? Toucans live in jungle rain forests. Toucans are friendly to humans and are very smart. Toucans is a bad aviator. They'd rather jump on a limb than fly. Its beak can reach 20 cm. Its long beak allows it to reach fruits grown on branches or distant twigs. The call of a toucan sounds like the croak of a frog and can be heard for about a half mile away. The toucan is known to be one of the nosiest jungle birds. The beak of the toucan is made of the same material as your fingernails. While most birds that are raised in captivity to become pets are hatched in incubators and hand fed, toucans, because they are so very friendly are usually raised by their parents. Toucan birds lay around 2-4 eggs, the eggs will hatch after 2 weeks. For three or four weeks after hatching, the young toucan can not open their eyes. A few weeks later, he left his mother's nest.